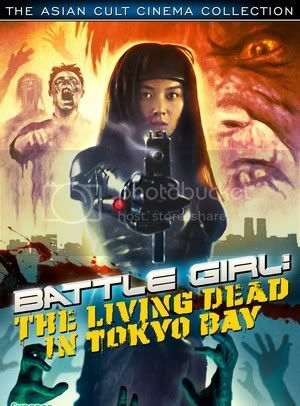 Battle Girl: The Living Dead in Tokyo Bay is not a good movie by any stretch of the imagination. It is campy, gruesome fun, and interesting as a predecessor to the shock films that Japan has been producing recently, ranging from Tokyo Gore Police [review here] and The Machine Girl to Vampire Girl vs. Frankenstein Girl, but it is not a good film. And honestly, who would expect a film with this title to be good? And would anyone seek it out if they weren’t anticipating gory, campy, science fiction? The story combines elements of post-apocalyptic films, zombie infection, and a singular female hero who is a war machine. As the movie opens there is a large meteor heading toward earth, where it proceeds to collide with Tokyo Bay. The heat from the impact creates a vast cloud of steam that forms a shield around Tokyo, bathing the city in an eerie fog. There are other effects, too, as the shield cloud seems to contain a strange element named cosmo amphetamine. This cosmo amphetamine acts as a zombie creator, causing dead people to wake up and stalk the living, hoping to chew on some fresh flesh. 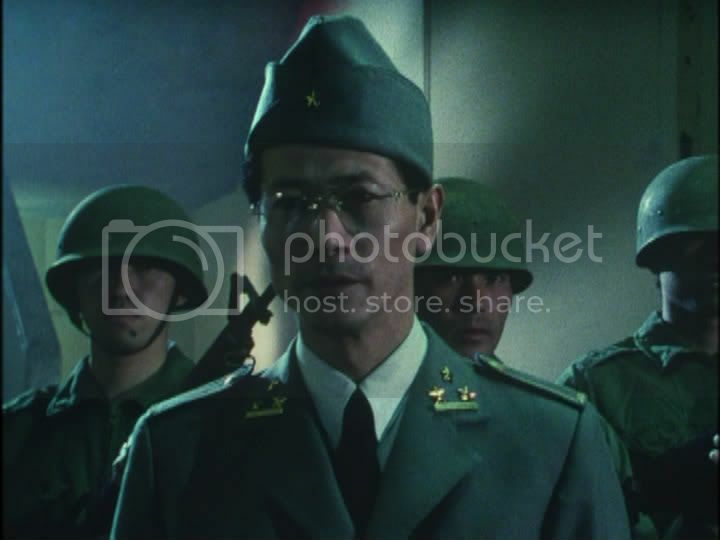 Amidst the confusion of a city quarantined and beset by hordes of living dead there are small pockets of humans and a squad of military men led by the evil General Hugioka (Kenji Otsuki). He has declared martial law, and commands his soldiers as he performs perverse experiments with the cosmo amphetamine. 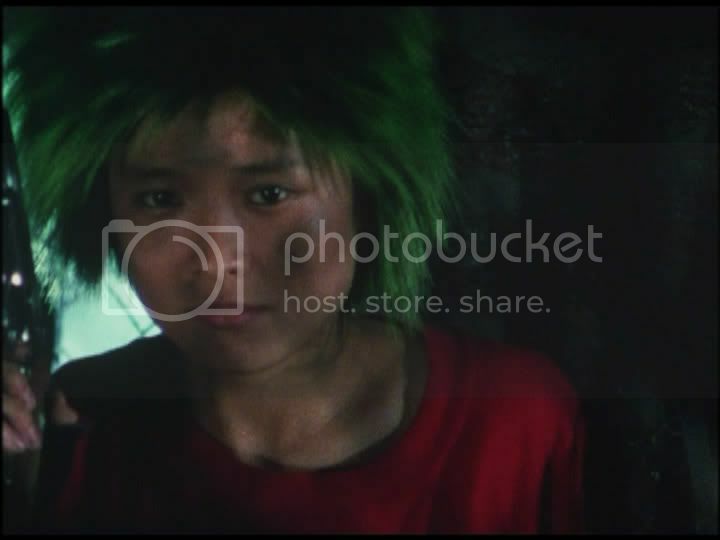 But there is a rogue warrior on the loose, the titular Battle Girl (Cutey Suzuki). Her name is Keiko Kirihara and she is the daughter of the ranking army commander. He has been lost in the shuffle, leaving behind only an instructional video and a battle suit for his daughter. Donning the odd-looking black outfit Keiko teams up with a roaming squad of ammunition hawkers to fight through hordes of undead, a squad of Human Hunters, and some of the General’s monstrous beasts, enormous women who have been exposed to cosmo amphetamine. The plot sounds silly, is silly, and doesn’t really matter. Any exposition serves to create battlefields for humans to face off against either the zombies or other humans. There are a number of violent sequences, many of them involving bullets riddling undead corpses. There are a variety of heads that explode and even a fantastic plastic head that becomes the home of a lobbed grenade, caving in gently under the weight of the projectile before exploding. Keiko is the science fiction version of Japanese heroines like Lady Snowblood (or any of Meiko Kaji’s roles), and the spiritual ancestor of The Machine Girl’s Ami, though she is not as cool as either of those two heroines. It would be unfair to expect Battle Girl: The Living Dead in Tokyo Bay to be a good-looking film; it was initially made for video, in the vein of the Guinea Pig [review here] movies and other Japanese horror films from the 1980’s and early 1990’s. The films were cheap to produce but don’t end up looking fantastic, much like how the modern shock films rely heavily on CG to look acceptable while never achieving greatness. In spite of the low video quality the production is generally acceptable. 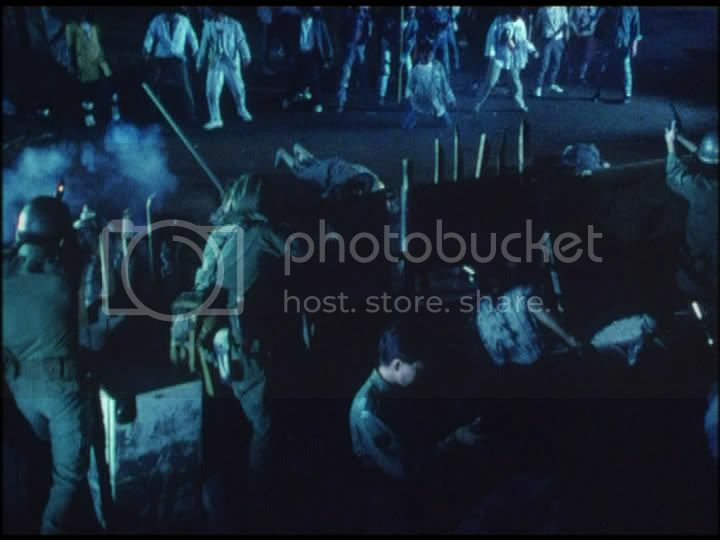 There are large sets, including some huge industrial areas, and sometimes a couple dozen zombies on screen at once. The battle suits look as though a fair amount of consideration went into their construction, if not their design. The primary draw will be the promise of cheesy camp, and audiences expecting pure campiness will not be disappointed. From the opening green-and-black graphics to the exploding heads and mediocre fight scenes, the film screams low-budget schlock. The violence and gore are generally pulled off with aplomb, and the actors take their roles seriously, further enhancing the camp value. This is a perfect movie to watch with a group of friends; the subtitles make it possible to talk loudly while still following the story sufficiently. Anyone attracted by the title will not be disappointed, and I, for one, was also interested in Battle Girl: The Living Dead in Tokyo Bay’s connection to both the past and present of violent Japanese cinema. This entry was posted in 2 stars, 3 pirate flags, B, Movie Reviews, Pirate Flag Rating, Star Rating on February 27, 2010 by Tim Irwin.